The last decade has seen an explosion of online tools and services. Especially in the coding world, a lot has happened. If you’ve been stuck in a cave for all this time, or have been coding in your man cave without ever reading developer news, you may have missed out on some real gems! This is the Mother Of All Coding Tools. A REPL is a Read Eval Print Loop. In other words, the computer reads what you have created, executes the code, prints the output, and then gives you a chance to go change your code, after which the loop starts again. You could also call this ‘an interactive shell’, but in contrast to normal operating system shells, like the command window in Windows, repl.it offers shells for all kinds of programming languages. On top of this interactive shell repl.it has created a community for teaching, complete with courses, subscribing students and tracking. Again I am placing two tools together, but in this case they have the same purpose yet look totally different. It’s like comparing a katana to a swiss army knife. Codetracer is the katana. It’s a place where you can post a piece of code, and instantly get feedback from others, line by line. Stackoverflow is a giant, and less a tool and more a community. It’s the Google for Developers: every coding problem known to man has been solved before on stackoverflow. But, getting answers on a specific question you should post is horrendous: often questions are downvoted, censored, or outright deleted. On top of that some stackoverflow members like to mock or insult people for not following guidelines or not investigating their problem enough. Simple questions just do not belong on stackoverflow (like: how do I sort this array?). Debugle is the most slick and simple interface for listing and tracking your bugs while coding. It’s catered especially for single developers or very small teams. Toggl is the most slick and simple interface for time tracking (hey I get a deja vu here!). Together with Debugle you have an independent developers coding workspace setup in a jiffy. By indenting tasks you can separate tasks from categories, and using workflowy you can really go wild with your creative task lists. Filter by date, by description, by status, you name it. Also entering tasks is so simple it’s a breath of fresh air compared to Outlook or other monsters that make you go through hoops just to write ‘try out several button styles’. Handwriting is very personal, this can give a personal touch to your logo, your site, product, app or videos. Download the plugin (we’re not on the WordPress directory yet). Go to your admin section in WordPress and choose Plugins. There is currently only one option: text. This defines what text to show on the page. You will probably want to customize the CSS file, which is in the same folder as the plugin. By default the text appears in div#pen, which will be placed right below the content of the post. The plugin is programmed to only work on a home page (using is_frontpage), because having a handwriting animation on every page gives bad usability. As already said, it has only one font: ‘Tangerine’ (a Google Font). There is only one font (Tangerine). If you want to use another font, you’ll have to do the preparations yourself: create a cufonized font and modify the default in Scribbler.php. There are no known problems as of yet. If you want to help me, I’d appreciate to be sent cufonized fonts. I will then implement the use of that font in the plugin. I want this too on my site! If you’re not technically inclined I can customize it for you on your site. Just leave a comment or contact me (http://about.me/michiel) and we can agree on a price. Recently I have been trying to limit my use of VBA. It’s not that I was addicted and needed to go to VBA-rehab, on the contrary, I still love VBA till death do us part. But the thing is, every time someone opens an Excel sheet with VBA macros they are reminded of Excel’s vulnerability and the risks of macros. So I set out to make workbooks that do the same thing, but without VBA. Not always is this possible, or efficient to do so. But when it’s possible, it also comes with great performance and great stability. No code needs to be changed, ever. Of course there are also downsides. It’s not as flexible as VBA, so you’re stuck in a rigid framework that solves one thing and one thing only. But it does it so well, oh my. My latest endeavor was with permutations. I needed something that would generate all permutations of the tokens F,C,R,A (don’t ask) with repetition. As some know I am an avid speed cuber, that is solving the Rubik’s cube for speed. And the Rubik’s cube is a permutation puzzle. So I have dealt with permutations quite a lot. For those who haven’t paid attention in math class: you should know that permutations come in two flavors: with repetition (Pr) and without repetition (P). The number of permutations (Pr) in these four tokens F,C,R,A is 4^4, or 256. That number is exponential, so it grows so fast that at 5 tokens you are at 3,125 permutations and at 6 tokens at 46,656 permutations. At a set size of 10 tokens you are at 10^10 or 10,000,000,000 (ten billion) permutations. VBA would surely choke on that number of statements to follow. Excel can handle 1 million rows, although I wouldn’t put it to the test with that. I started out writing a VBA program, that generates all permutations (Pr). The funny thing is if you go online and expect to find a bunch of worked out examples of algorithms, you don’t. Almost all examples you find are about permutations without repetition, which is like working with real objects, since you can’t duplicate real objects. The lottery is a good example of this. The program worked, but it was slow, and cumbersome. So let’s drop VBA and try it without. First, I set out with some settings (sheet ‘settings’). We define the pattern, and calculate the size of the set (using LEN), and the number of possible permutations (using Length^Length). These values will be used extensively in the functions to generate permutations. The maximum length of the pattern is set to 5, which totals 3,125 permutations, an amount which Excel can handle in the blink of an eye. You could extend the grid to a width of 7, which would come to 823,543 permutations. I’d be interested to know how fast Excel would generate the output, and how big the file would become. If you try it out please let me know. Go to the output sheet and look at the grid on the right. There you see in the top row a couple of simple formulas. They are to set the repeat cycle of that column. In the first column you see a token repeated once, in the second column 4 times, in the third column 16 times. We’re multiplying by Length to set the repeat cycle. This is an easy way to generate permutations of any set. Think of how it works with regular counting. You start with 0,1,2,3,4,5,6,7,8,9, and then go one digit to the left, and you repeat, but now in cycles of 10, so that 10,11,12,13,14,15,16,17,18,19 has exactly 10 times a 1. We’re using the same principle. If you don’t know MOD, this is a function for modulo, also called the remainder after performing division. The MID function gets a character from a specified position in the string. The column with N is simply to count and use the MOD function properly. By using absolute referencing we are now able to copy the cell E4 to all other cells in the grid, while keeping a properly working formula. With a pattern of length 4 we can ignore the last column, which is only needed for a pattern of length 5. In the settings sheet you will see a width and a height. By selecting the range starting at E4 with that width and height, we get exactly all permutations in the set. 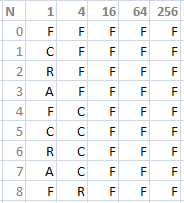 Using FCRA as a pattern we can now see all 256 permutations in column A! Well, permutations without repetition are actually a subset of permutations with repetition (P < Pr). In a permutation without repetition you don’t have any duplicates. So for the tokens F,C,R,A a valid Pr would be FFFF, but it’s not a member of P. You can only get a member of P by swapping original tokens. So e.g. FRCA is a member of P. That’s why the number of items in P doesn’t grow as fast as in Pr. Four tokens gets to 4*3*2*1=24 permutations. This is called a factorial. What it does is it totals the frequencies of each character in the set, so in this case it returns 2, and then checks to see if it matches the length (4). If it matches we have a permutation. Note this only works for patterns that have no repeating tokens, like FCRA. Now we have a formula to detect permutations. Unfortunately we still have duplicates, because our table always has 5 tokens and we might have a shorter pattern, like our example FCRA. So we use an IF to detect empty cells in column A and we can now use Excel’s filter (On the ribbon choose Data, then Filter) to get all permutations. A couple of days ago I saw something in an article on StackOverflow, that blew my mind. I can’t find the article anymore, but I do remember what this one neat trick was, that will for ever change your VBA. It’s called a named range, and I found out I had always been doing it wrong. So have you, most likely. Have you ever written something like this? Note that with this notation we don’t use double quotes around the name of the range. A quite mighty use for this, is that we can now write code with a lot less variables, if we let Excel do the work for us. Now you can fill the table you just made with all kinds of settings, constants or calculations that you want to use in your elaborate VBA program. In line 3 I fill the named range ‘studentNr’ with a value taken from a folder, which contains a student number. In the next line, I check if a folder for that students’ class has already been made, and if not, I make the folder. The variable [sClass] does not exist in my code. It only exists in my variable table in Excel. The cell contains a VLookup function to find in which class this student is currently enrolled. Similarly I have a [Teacher] variable, also with a VLookup function. NewFolder is simply a concatenation and formatting, which is also easily done in Excel. As you can see, the values for [sClass], [Teacher] and [newFolder] are filled automatically by Excel, and I don’t have to process anything. Programming like this in Excel is a new paradigm. You don’t churn out all your code top-to-bottom as you used to. You create sheets with lots of calculations, lookups etc, and then you make a tiny program that links all this together. Excel can do some crazy fast, complex stuff, and you should never have to program those anymore! Well wasn’t that incredible? You may not be used to programming like this, and I recommend this method only for experts. You should be in full control of the worksheets, or otherwise someone will mess with your program. Also, when you are part of a team, you should make sure this ‘magic’ is elaborately documented in the code (e.g. in a header of the function mention which Excel named ranges are used). This is a super powerfeature I have always missed in Excel: the ability to join the content of cells without losing any data. Sorry, what’s that?? Yes, I know about the ‘merge’ option. It’s lame! Try merging two cells that both have content. Excel answers, delightfully happy, that you will only keep data in the first cell and lose all of the data of the other cells, and go deal with it. So, I decided to ‘deal with it’ and I present here several macros for your pleasure and entertainment that will solve this once and for all. Well, that’s all the same of course. Let’s start with a simple macro to join a bunch of cells and put the result in the first cell. How does it work? First, we define the variable out which will contain all content. Then we loop over all cells in the current selection and we combine their values using the concatenation operator “&”. Finally we put the value of out in the first cell of the selection. If you have never created a macro before, you can add them by pressing ALT+F11. After that, make sure to copy this one to the personal macro workbook. In some occasions I needed to merge, but also keep the data separated by either commas or newlines. So I made a slightly modified version with arguments. Note for noobs: you can’t run these like normal macros, you’d have to go into the VB editor and start them from the immediate window. Or, you can make a short calling-macro similar to the JoinWithBreaks below. And let’s say it extends a long long way to the bottom for your archive of ten years. To create a usable Excel table and e.g. 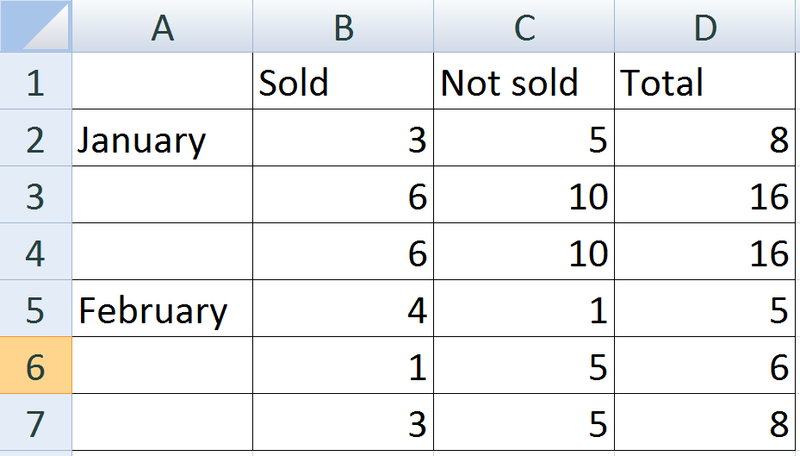 to create a pivot table your table needs to have values in every cell, not just the first one. Humans can reason that cell A3 also belongs to January, but computers and thus Excel cannot. Clicking on the autofill handle in cell A2 fixes this, but doing so for 100 cells is still very tedious work. For that, we can use the following macro, which will automagically fill every empty cell with the value right above it. One of the hardest topics in school next to computer science is physics. Time and again I see students struggle with the topics, and I have to admit I didn’t find it easy in high school myself. So I started studying physics again using Khan Academy, and gained much insight into the basics. I have admired Sal Khan since he started his site, and as a school teacher I also think I should help him, and my students, wherever possible. I started drawing a diagram of how all things in physics connected to each other, and while doing that, I realized there should be software to do this better. After a short search I found the wonderful D3 toolkit, based on web standards, just as I like it. D3 can create awesome diagrams, graphs, infographics, you name it. So now I have for your pleasure and learning aid a physics based overview of common physics quantities. Click the image to see the actual animated model. blue – essential axiomatic units Mass, Length and Time. Learn more about these in this lecture by Walter Lewin. To use this diagram in your physics assignment, look at the known variables. Find those in the diagram. Now see if you can combine those to make more variables: follow the arrows. If you can start from two known values you can usually calculate a third. You continue doing this until you have found the desired outcome. When we write for the web we most certainly write for the fast paced audience that has no time to read pages and pages of text. That’s a given, and it’s what sets it apart from writing for paper. The other characteristic is links: if you need to explain something, it’s easier to just link to wikipedia than to insert the actual text. Also you don’t want to infringe on copyright. easy to read: plain fonts, short sentences, short text, clear message, bold, pictures and diagrams that explain difficult topics. easy to find: clear headings, short sentences, keywords in bold (not the same ones), no pictures required. In my opinion you should work from the outside in: make it look good, then make it easy to use, easy to read, easy to find and easy to sell, in that order. But as you make it look good (design process) you can of course have some consideration for the other aspects. 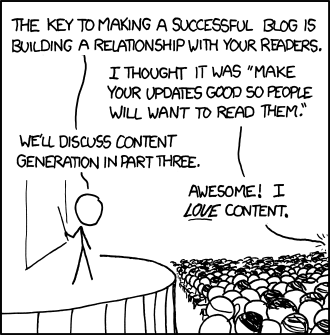 It should also be noted that SEO is still voodoo, since nobody knows how Google really works. Also, search engines, in particular Google, change their ways of working constantly and they get better and better at identifying your pages. So don’t try to fool them, it’s not worth it. There will probably always be a battle between usability experts and designers, because their worlds are so far apart. But to a modern web user something like useit.com looks like it was made 20 years ago and doesn’t instill trust in a user, something that is vital to sales. Remember I may not be an expert in all those areas, but the ideas presented do come from the leading experts in these areas.